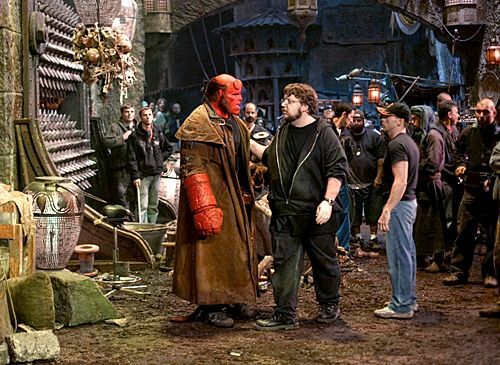 Hellboy 3 is one of those projects that Guillermo del Toro fans just can’t let go of. I don’t blame them. To me, it’s an interesting property that is in many ways perfect for the filmmaker and I think he was just really finding his way into what the big screen version of it wanted to be (which is to say I think Hellboy 2 was at least twice as good as the original film). But it doesn’t look like it’s in the cards. It’s an unfortunate status he’s hinted at for a while, that he feels there just wasn’t enough interest to justify the $150 million price tag the film would require. Steve did an epic interview with del Toro earlier in the week that covered stuff like the Pacific Rim Animated Series, At the Mountains of Madness, Crimson Peak and The Strain along with his new Black and White movie. But today del Toro gave a taste of what Hellboy 3 might have been, despite that fact that it will (probably) never be. Hit the jump for more. I’m a little sad because that seems like a fairly epic escalation from the second film and a truly epic way to end the series. Still, at least we got two good movies out of it.